This subtly flavoured dish is easy to prepare, and especially good on a barbecue. If using bamboo skewers, it’s advisable to pre-soak the skewers in water for a couple of hours beforehand. 1. 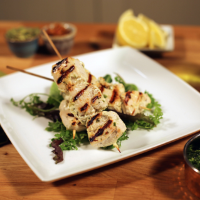 Marinate the chicken breast with salt, ginger and garlic paste, coriander and lemon and set it aside for 20 minutes. 2. For the second marinade, mix together the cream cheese, yogurt, cracked black pepper, salt, ginger and green chilli, mace and cardamom powder in a mixing bowl. Add in the second marinade to the pre-marinated chicken and mix well. Fold in the cream - you have to be careful as this mixture might split if mixed vigorously. 3. Set aside the chicken in a refrigerator for another 20 minutes before threading onto pre-soaked skewers. 4. Cook the skewers by placing under a preheated grill for 15 minutes, turning frequently, or in the oven at 200oC, gas mark 6 for 25 minutes or barbecue until thoroughly cooked and the juices run clear. 5. Drizzle with remaining lemon and serve with the chutney and mixed greens.